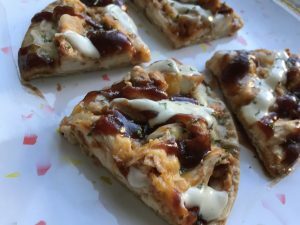 I make my husband my Keto flatbread pizzas ALL the time. Usually with pepperoni, however, recently I’ve been playing around with different toppings options. 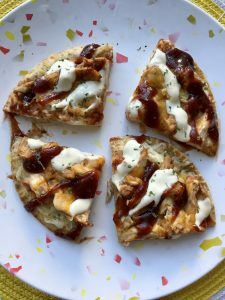 This bbq chicken pizza came together just as quickly as the pepperoni and was just as yummy! These are perfect for nights where the rest of the family orders/makes pizza or even as a late night snack. Keto inclusion is such a key when one member of the family is on a diet. It’s important to me to keep our meals streamlined and similar when we all sit down to eat dinner together. Preheat your oven to 350 degrees, and line a baking sheet with parchments paper. 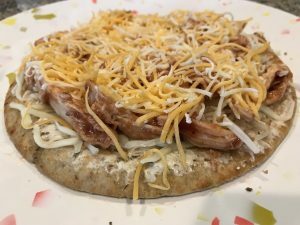 Using the same method I did for my Keto flat bread pizza I prepare my crust. Using either a keto wrap or pita, drizzle olive oil and spices, massage everything evenly over your crust, then bake for 5 minutes. Now it’s time to top your pizza, first up comes cheese step 1. Spread a thin layer of cream cheese over the top of your pre baked pizza crust, this will act as you glue because you won’t be using a sauce. The cream cheese will melt upon baking making it a creamier element, giving almost a baked sauce like consistency. Next toss your cooked shredded or chopped chicken in half your bbq sauce. Spread chicken over the pizza pressing down slightly so that it does stick to the cream cheese and stay in place. Next comes cheeses 2 and 3 top the chicken with mozzarella and cheddar cheese and bake for 5-7 minutes. 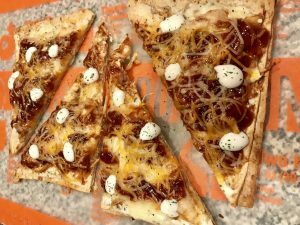 When the pizza comes out of the oven drizzle remaining bbq sauce over the top and ranch dressing or other addional toppings, if desired. Serve immediately. Here is post baked, pre topped crust to give you an idea of what you’re looking for, and once topped how it will look before going back into the oven. 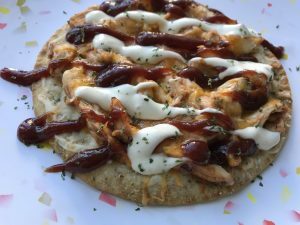 I have tried making these with both the keto wraps and the keto pitas. 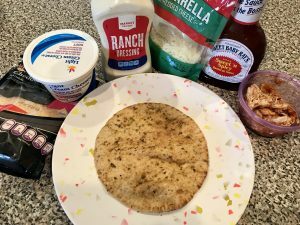 My husband insists that even though the pitas are smaller in size, they are thicker and give more of a “deep dish” pizza feel, or as deep dish as something can feel on a low carb diet. 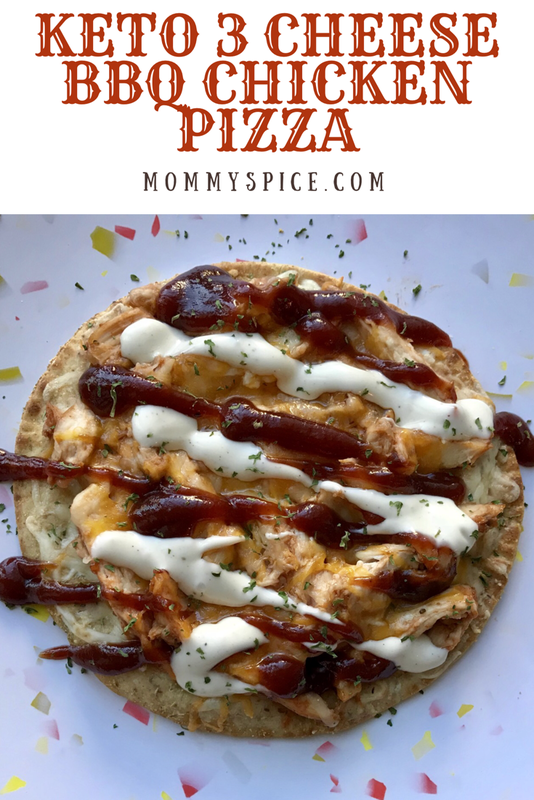 It may seem odd that you’re leaving a sauce off of this pizza, however, you are topping it with BBQ sauce and that adds a lot of moisture and you won’t miss a traditional pizza sauce when eating it. If you like to use ranch on your BBQ chicken then that’s even more sauce you’ll have, I use about a tablespoon either drizzled or dotted over the top of the BBQ sauce. My tip for this one, use rotisserie chicken! Those chickens are a steal at the grocery store, cost wise and I can usually make 2-3 meals from then chicken. I immediately cut all of the meat off the bone and store it in an air tight container in my fridge and it will keep for 4 days or so to make easy wraps, pizza toppings or to throw into dinners. This week I used our rotisserie chicken, to make this pizza, top my pumpkin alfredo for dinner one night, and to make my husband a chicken wrap for lunch one day.